Rihanna is on the cover of GARAGE Magazine Issue 15 that hit newsstands September 6th. Shot by Deana Lawson and styled by Carlos Nazario, the shoot has a vintage feel to it. 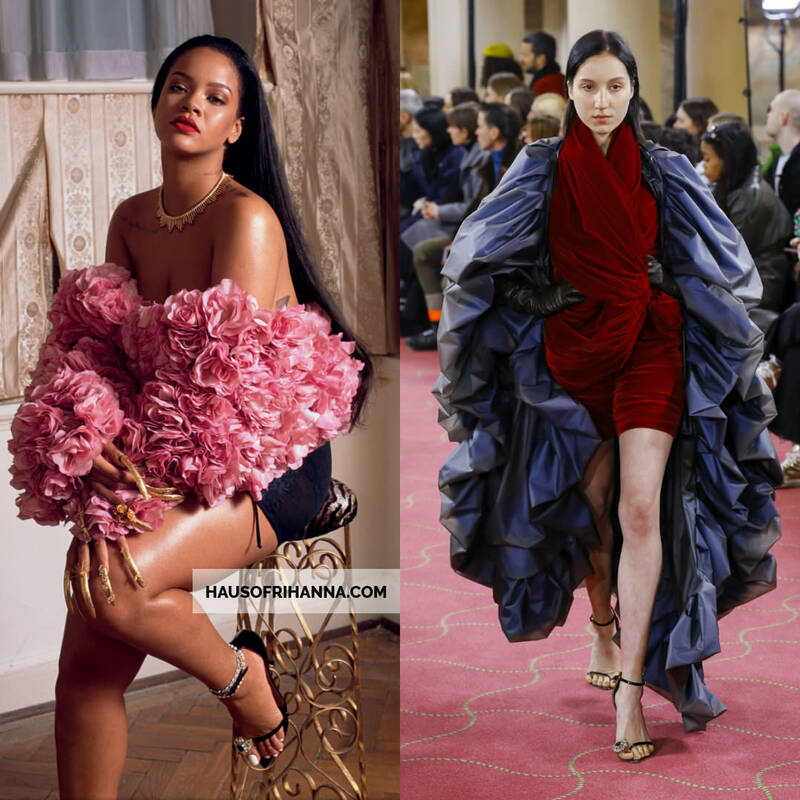 A few regulars from Rih’s glam team worked on the shoot. These are Yusef Williams on hair and Jenny Longworth on nails. Lisa Eldridge did the makeup using Fenty Beauty products. Let’s get into the fashion. On the cover Rihanna wore a Tiffany & Co Schlumberger chevron fringe necklace. A modern take on a design by Jean Schlumberger, the necklace features 18kt gold and round rubies. The jacket is a vintage piece sourced from One of a Kind Archive. Designed by Rachel London in the late 1980s, the pink roses feel like real flowers. It’s currently available to purchase for $4,217.44 at 1stDibs. 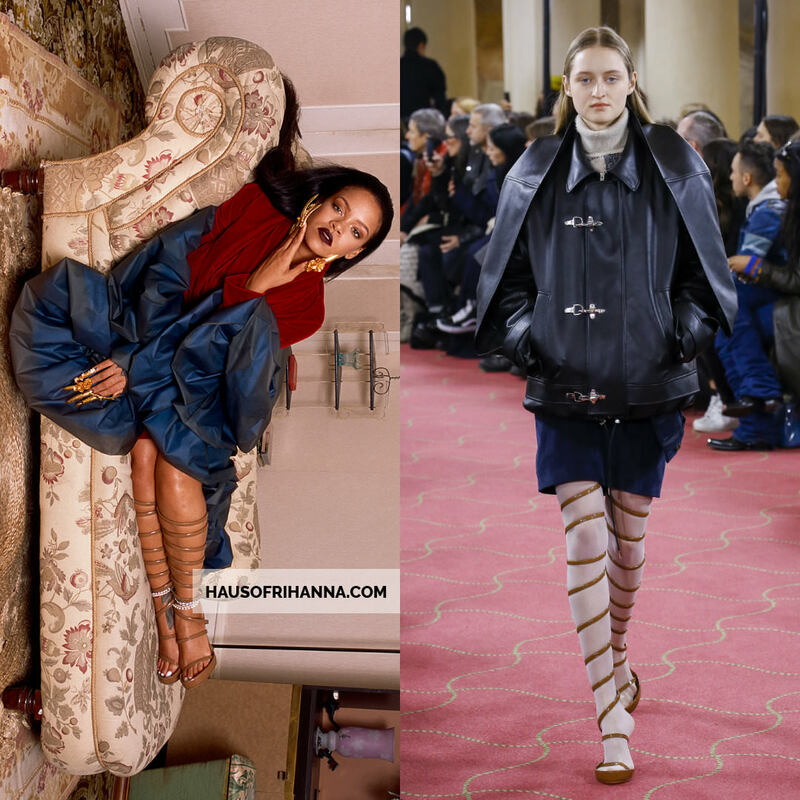 Rih’s black sandals are from Y/Project‘s Fall/Winter 2018 collection. They have crystal embellishment on the big toe. The black lace briefs are Dolce & Gabbana. I’m pretty sure the anklets are the same ones she wore to the Met Gala since she did this shoot days after that. Those include a few designed by XIV Karats. 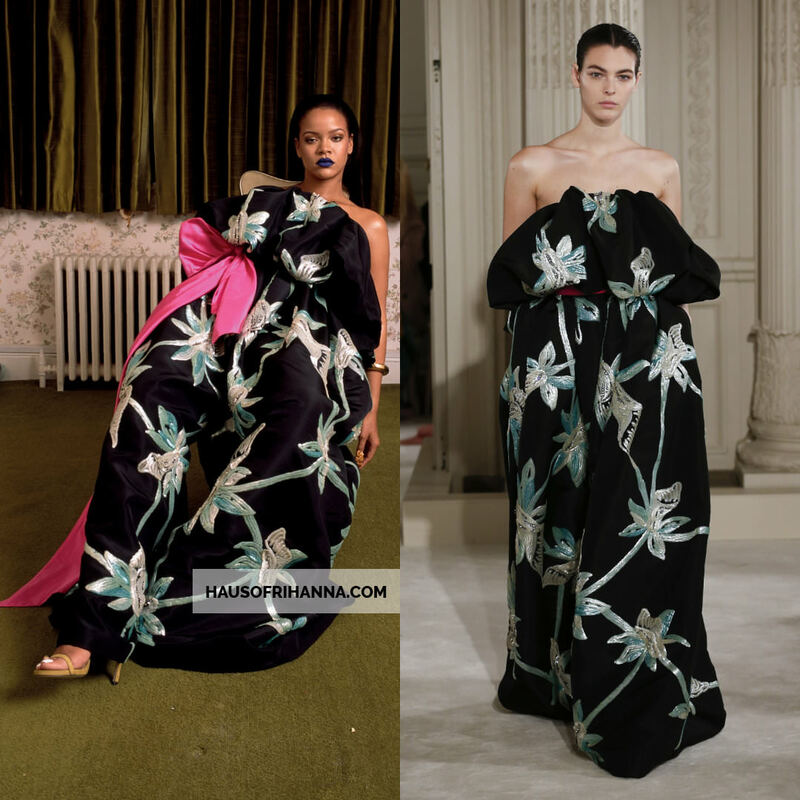 In this photo the superstar wore a black floral jumpsuit from Valentino‘s Spring 2018 couture collection [Look 64]. Her suede shoes are Stuart Weitzman. She also donned a Tiffany & Co x Elsa Peretti doughnut bangle. Made of 18kt rose gold, it costs $18,000. 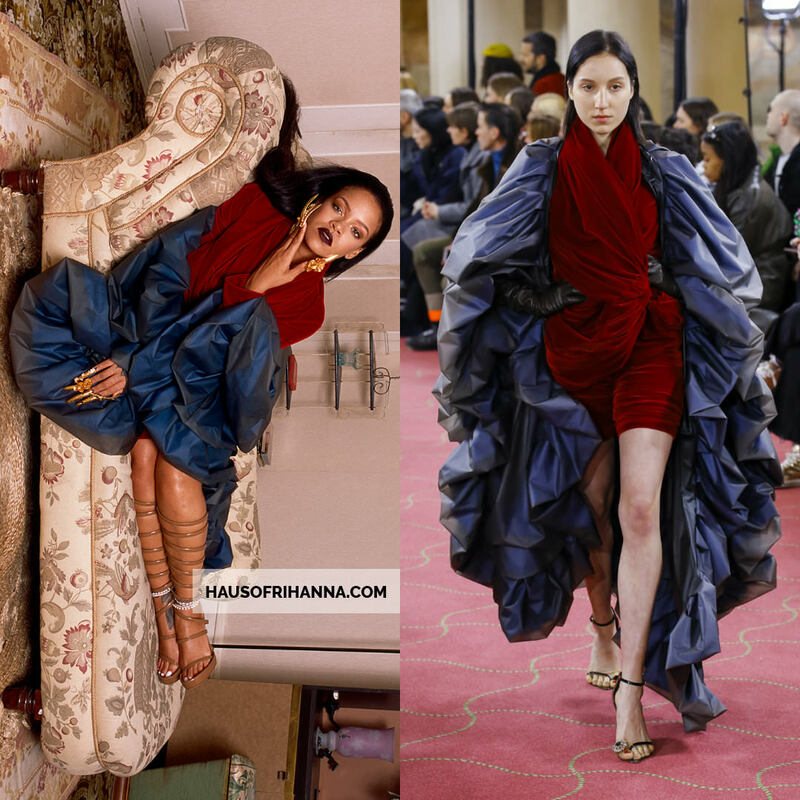 Next Rihanna relaxed in a Gucci lurex dress with bows ($6,5000, worn as a top). The Fall/Winter 2018 dress has billowing sleeves and an asymmetrical hemline. The yellow skirt is another vintage piece from One of a Kind Archive. Her metallic silver ankle-wrap sandals are Valentino Spring 2018 couture. The earrings are Rihanna’s own while the ring is Tiffany & Co. 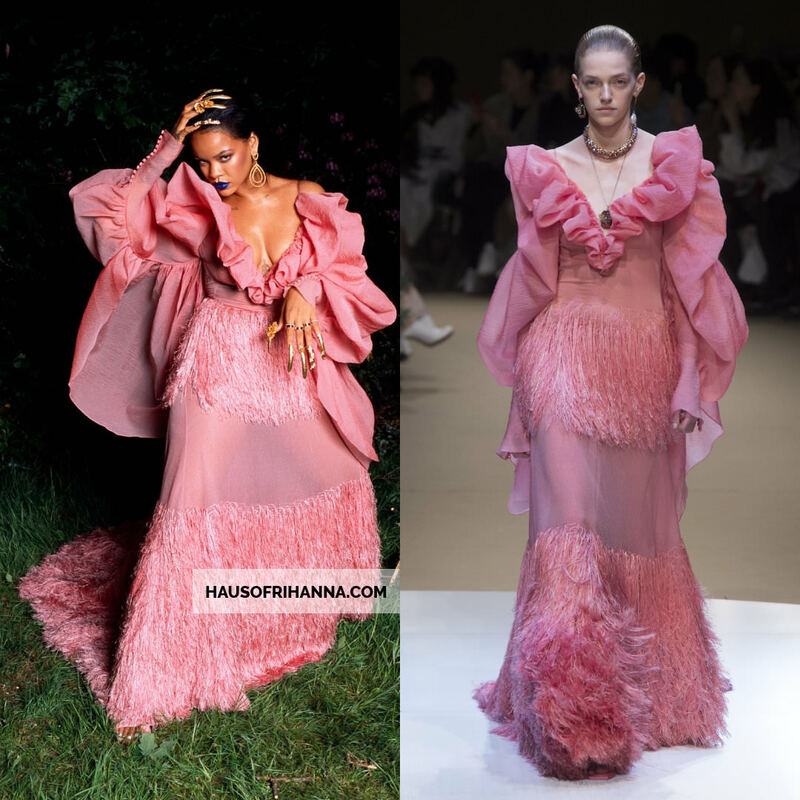 Above the Barbadian mogul sported a pink gown with fringe detail from Alexander McQueen‘s Fall/Winter 2018 collection [Look 41]. The frock features a v neckline with ruffle trim and long sleeves. 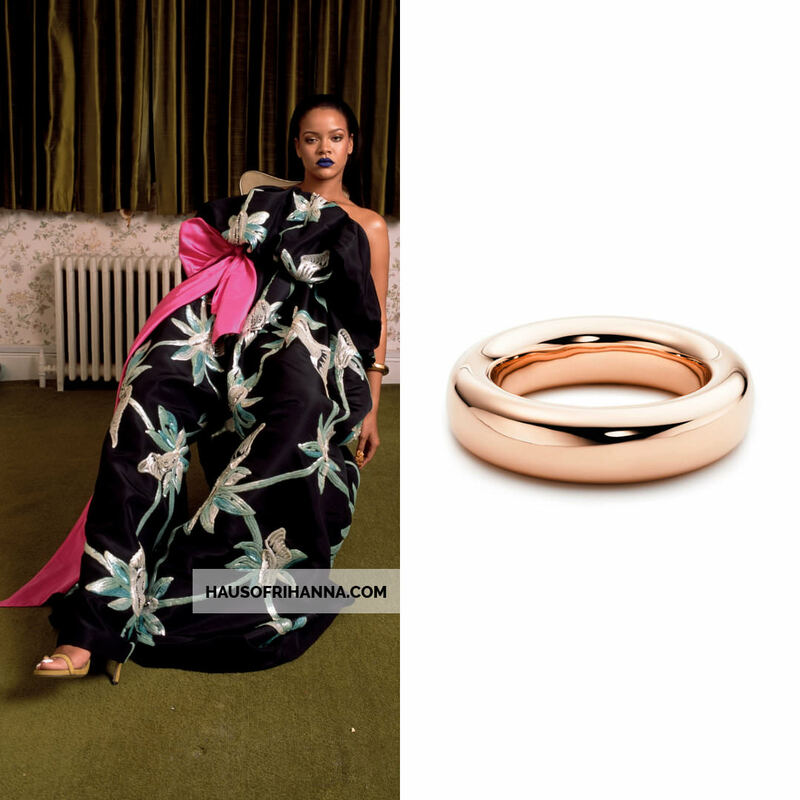 The rings are Tiffany & Co.
Rihanna and Y/Project are always a good combination. Here she wore what appears to be a red romper and a ruffled coat from the brand’s Fall/Winter 2018 collection [Look 25]. The patent leather spiral sandals are also Y/Project Fall ’18. 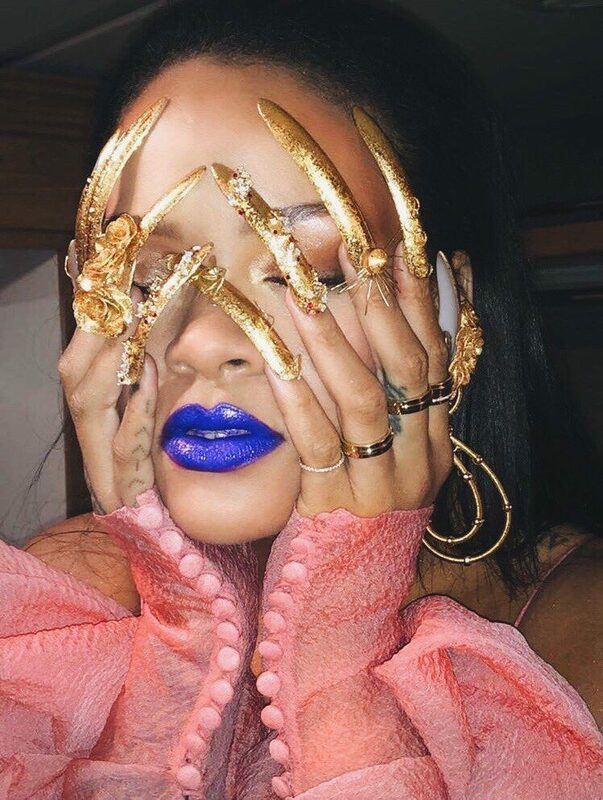 Finally, let’s take a closer look at those crazy good gold nails by Jenny Longworth. They definitely stood out in every photo (in a good way) and were the perfect accessories.